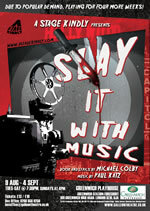 A Stage Kindly's production of Slay It With Music is transferring from the Space on the Isle of Dogs to the Greenwich Playhouse in South London from 9th August-4th September. It tells the story of an ageing film-star’s comeback in a gory horror film. Movie star Enid Beaucoup was forced into retirement by a gory scandal that rocked her career, and now lives on her sister’s moderate success acting in soap operas. But after her sister is fired Enid has no choice but to head back to the silver screen. Supported by her adoring butler (though not by her nosy neighbours’ creepy kid), Enid finds out that the road back to stardom is not without its pitfalls, but certainly is a barrel of laughs. Cast includes Andrea Miller, Ellen Verenieks, Helen Kelly, Candice Palladino, Charlotte Stevenson, Gemma Rook, Sofokolis Kostoulas, Andrew Hayler, Mark Lawson, Hayley Sheldon, Sarah Nightingale, Nick Whitfield. Book & Lyrics by Michael Colby, music by Paul Katz. Directed by Joseph Walsh: musical director - James Cleeve.